In contrast to most site around Williamsburg yesterday, which were buzzing with weekday construction work, 568 Union Avenue was quiet. (This is slightly ironic in that when demolition was going on some neighbors stuck "No Weekend Work" stickers on the fence.) That was then, however, and this is now. For now, 568 Union is quiet. (To see the future Chocolate, click here.) It only has a fence that is open enough to allow access to the site and that is so shoddy that it appears ready to fall over on the sidewalk. 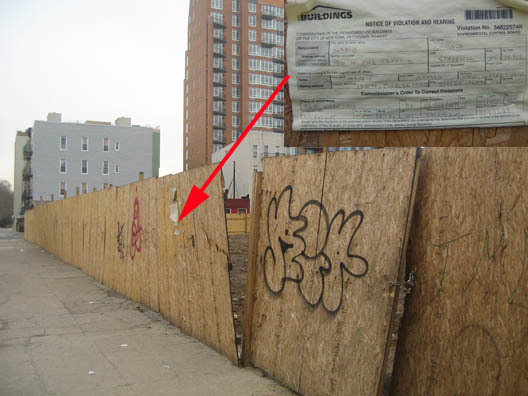 The Department of Buildings, on a recent visit, noted that the "fence has holes and is in danger of collapse." Several violations, the most recent on December 21, have been written on the former Manhattan Chocolate Building. The collapsing, open fence now has a violation notice taped to it.